RIDGID Segmented Diamond Blades are made with Hi-Grade diamond powder with a proprietary bond engineered for maximum cutting performance. Use a segmented rim for faster and aggressive cutting. Segmented blades are designed to cut a wide range of masonry and construction materials. The Bosch Carbide for Laminate Jig Saw Blade is tough enough to withstand a nail hit and keep going no change-out required. These premium carbide for laminate blades employ two rows of counter-directed teeth that are arranged at different angles. The teeth provide clean, chip-free cuts in laminates and laminate flooring. Laminates are abrasive materials that are tough on blade life, but Bosch-exclusive carbide delivers 10X life versus standard bi-metal blades. So one jig saw blade really does gives you the confidence to make clean cuts in laminates whether you are building or installing them. A thin blade kerf reduces material extraction, reduces heat and adds to performance. Bosch Carbide All-Purpose Jig Saw Blades are tough enough to withstand a nail hit and keep going no change-out required. A Bosch-exclusive carbide brazing technology delivers 10X life versus standard bi-metal blades. This all-purpose blade does it all in tough wood with nails and hard materials such as thick gauge metal like stainless steel up to 1/8 In. thick. The blade employs Progressor Technology, a combination of aggressive small teeth that work together with larger teeth to increase speed and to provide fast cuts and excellent chip clearance. This is accentuated by the jig saw's pendulum movement. It has an exaggerated tip ensures easy plunge cuts, and the speed is further optimized by the jig saw's pendulum movement being accentuated by the blade's tapered-ground back design. A thin blade kerf reduces material extraction, reduces heat and adds to performance. Tougher tungsten carbide stays sharper longer. Anti-stick coating reduces friction and gum-up. Thin kerf for smoother cuts. Ribbed heat vents allow blade to run cooler, reducing blade flexing and binding. All blades feature 5/8" arbor with diamond knock-out. 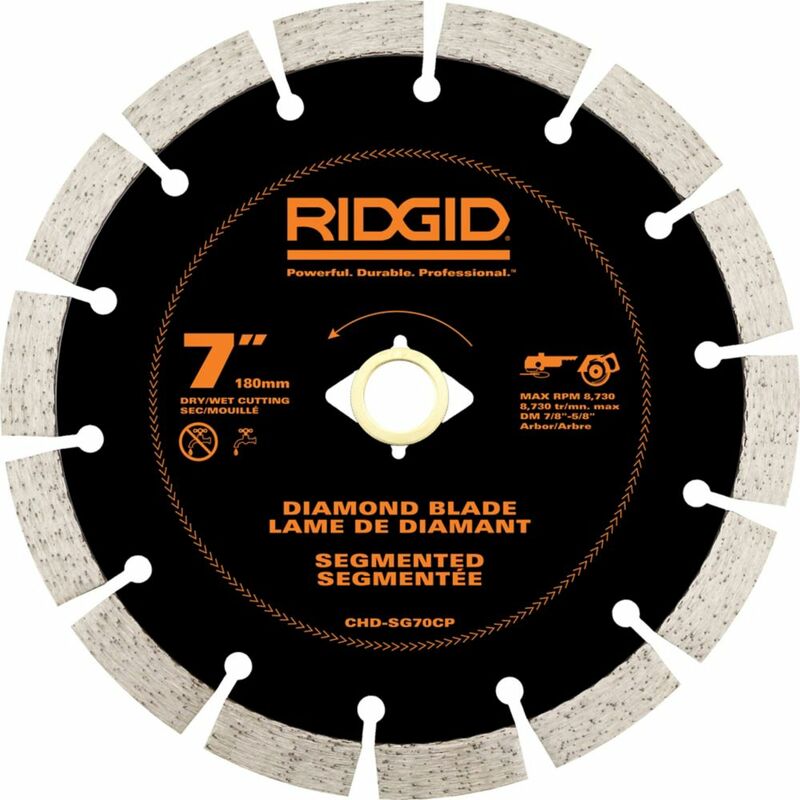 7 inch Segmented Diamond Blade RIDGID Segmented Diamond Blades are made with Hi-Grade diamond powder with a proprietary bond engineered for maximum cutting performance. Use a segmented rim for faster and aggressive cutting. Segmented blades are designed to cut a wide range of masonry and construction materials. 7 inch Segmented Diamond Blade is rated 4.7 out of 5 by 49. Rated 4 out of 5 by Mark from This blade was more than adequate to cut seasoned foundation concrete and did a good job with a M... This blade was more than adequate to cut seasoned foundation concrete and did a good job with a Makita saw. Rated 5 out of 5 by HomeDepotCustomer from While the grinder has a little kick to the left... While the grinder has a little kick to the left when first turned on, it performed excellently with no loss of power while I was cutting through a section of concrete slap. Not to mention it has a life time warranty once you register it online with Ridgid.